I was in the XBL code and MSP niche around a month ago. All real fans. 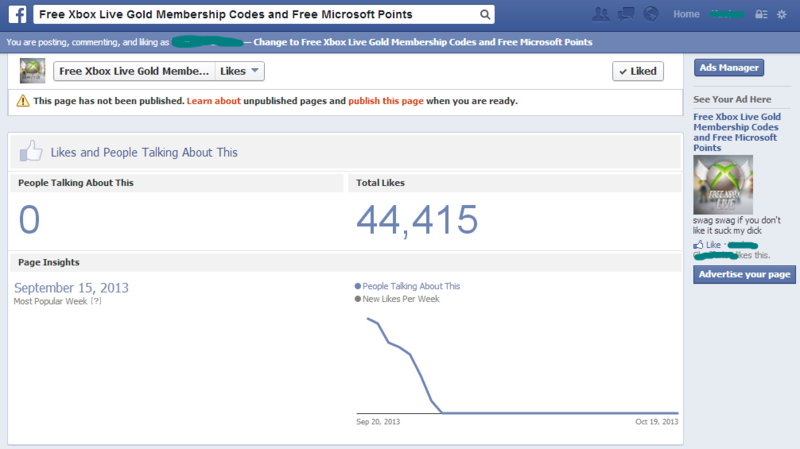 How were you seeing reports on your facebook pages? (2013-10-22, 08:52 AM)dan7123 Wrote: How were you seeing reports on your facebook pages? I wasn't. I was getting messages saying "fake, reported ur page" and mad 8 year old kids. Ok but how much money was made? Generally when you deceive someone, especially a gamer, they're going to be pissed, lol. Thats real inspiration man ! what methods did you use to get fans? Sorry but this page is USELESS. Likes are just numbers nothing else,the thing that matter is "talking about this"
(2013-10-22, 09:21 PM)Qspy Wrote: Sorry but this page is USELESS. You can read, right? The past month it's been unpublished and there has been no interaction, considering people can't see it. Your knowledge wonders me. You have method to increase the members. thats nice. now create another.